Mosaics are works of art that you proudly display in your home. No two mosaic projects are exactly alike. One of the great things about mosaics as a craft project is that you don’t need to be an expert to give it a try. 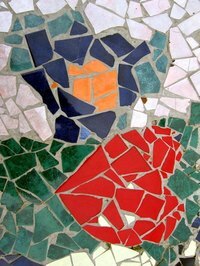 Mosaics are supposed to be slightly messy and imperfect, meaning that your little mistakes will only add to the beauty of the piece. Any concrete surface, like cement fiberboard, makes a great foundation for a mosaic. Use your creation as a tabletop or a decorative wall hanging. Roll out a piece of butcher paper on a separate work surface. Cut the paper so it is slightly larger than your concrete surface. Draw a rough sketch of your mosaic design on the butcher paper. Lay out the tiles on the butcher paper. Cut any pieces of tile that need to be cut with tile nippers. Dry set your design--i.e., lay out all the tile as you plan to on the actual cement surface--on the butcher paper. Spread cement-based mortar across the top of the concrete with a trowel. Mortar should be roughly 1/4 inch thick. Place the pieces of mosaic tile lightly in the mortar. Rearrange the tiles until you have the pieces placed exactly as you like. Go back to each piece and press it firmly into the adhesive. Let the mortar dry overnight. Smooth grout over the top of the mosaic tiles using a grout float, settling grout into the spaces between tiles. Choose any color grout that you like. Completely fill the spaces between tiles with grout. Wet a sponge with clean water. Remove all traces of grout from the mosaic with the wet sponge. Rinse your sponge with clean water often. Allow the grout to dry.